Students celebrate at last year’s UMass Boston commencement. 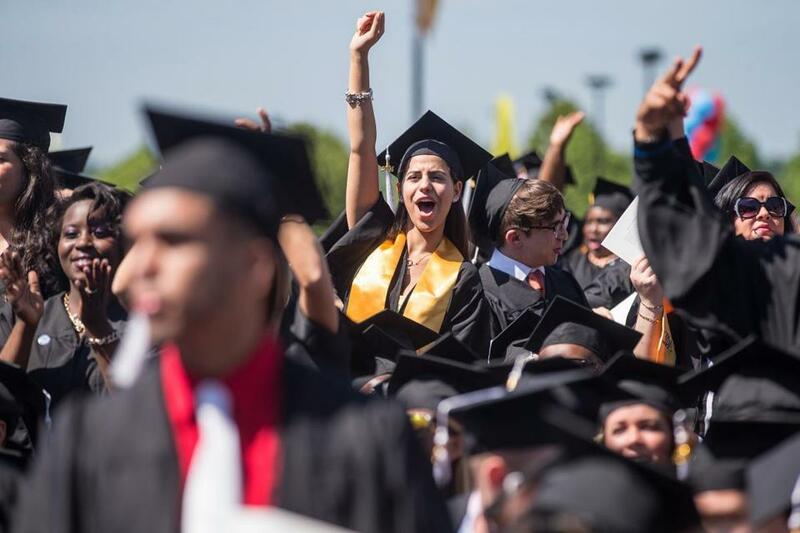 The whiff of spring is in the air, so cue up “Pomp and Circumstance.” It’s college commencement season once again in the region, a festive six-week celebration as freshly minted graduates head off into the world. Here is a rundown of the undergraduate ceremonies. Get the hankies ready. Speaker: Anil D. Jha, founder and chief executive officer of HydroNovation Inc.
Honorary degrees: Muir; Lawrence S. Bacow, president emeritus of Tufts University; Vanessa Kerry, co-founder and CEO of Seed Global Health; and Gabriel Jaramillo, former chairman, president, and CEO at Santander Holdings USA. Speaker: Karen S. Rohan, president of Aetna, Inc.
Honorary degree: Laurence Prusak ,ifounded and directed the Center for Business Innovation at Ernst and Young, and the IBM Institute for Knowledge Management; currently senior adviser on knowledge for NASA. Honorary degrees: Dr. Joyce Banda; Lawrence O’Donnell; Dr. Tiziana Filippini. Speakers: Pedro Noguera, executive director of the Metropolitan Center for Research on Equity and the Transformation of Schools; and Chris Van Allsburg, children’s author known for “Polar Express” and other works. Honorary degrees: Carole Cowan, former president of Middlesex Community College; John Sampas, literary executor of beat generation icon Jack Kerouac’s estate; (Second ceremony:) Barry Perry, former chairman and CEO, Engelhard Inc.
Speaker: Sonya Renee Taylor, poet, activist, and founder of The Body is Not an Apology movement. May 16, 11 a.m., Back Bay Events Center, 180 Berkeley St.
Speaker: US Representative. John Lewis, D-Ga.
Honorary degrees: Terrence W Macy, PhD, former commissioner of the Connecticut Department of Developmental Services; Catalanotti. Speakers: Kevin Colleran, early executive at Facebook and current managing partner at Slow Ventures; Richard Saul Wurman, renowned American architect and author. Honorary degrees: Colleran and Wurman. Honorary degrees: Blackmun and Laura Sen, president and chief executive officer of BJ’s Wholesale Club Inc.
Honorary degrees: Bourque and Nancy E Frates, mother of Pete Frates, the former Boston College baseball captain who has raised attention about ALS. Speaker: Lisa Szarkowski , vice president of humanitarian emergencies and executive communication for the US Fund for UNICEF. Honorary degrees: Szarkowski; Steven Hawley, former astronaut and a professor of physics and astronomy at the University of Kansas; David Wagner, founder and CEO of Evanston Capital Management and a member of the Wheaton Board of Trustees; Virginia Weil, retired senior managing director of the Business Council for International Understanding in Washington, D.C., and a former member of the Wheaton board. Honorary Degree: Feinberg; Rev. Elizabeth Walker, journalist and humanitarian; Robert Strecker, Harvard Medical School psychiatry professor; Arlene McNamee, Catholic Social Services executive director. Honorary degrees: Pickering; Suzanne Farrell, dancer and founder of The Suzanne Farrell Ballet at the Kennedy Center; Jamaica Kincaid, novelist, essayist and scholar; Yotam Ottolenghi, chef, restaurateur and author; Helen Vendler, poet, literary critic, scholar. Honorary degrees: Schneider; Robert Forrester, president and chief executive officer of Newman’s Own Foundation; Sheila Lirio Marcelo, founder and chief executive office of Care.com; Meredith K Monk, internationally acclaimed artist who explores boundaries between music and movement. BU trustee Allen Questrom; philanthropist Kelli Questrom; Grammy–winning jazz musician and producer George Wein. Honorary degrees: Suzin Bartley, executive director of Children’s Trust Fund; Joichi “Joi” Ito, activist, entrepreneur, venture capitalist, director of MIT Media Lab; Joseph Neubauer, business and civic leader; Navanethem “Navi” Pillay, jurist and human rights advocate; Jawole Willa Jo Zollar, dancer, teacher, choreographer. Honorary degrees: US Rep. William R Keating; John F Barros, chief of economic development for Boston; Paul Guzzi, president and CEO of the Greater Boston Chamber of Commerce; Anthony Pangaro, principal of Millennium Partners-Boston; Robert Brustein, director, actor, playwright; Gloria E White-Hammond, physician at the South End Community Center. Honorary degrees: Goldman; Mark Bittman,New York Times columnist; Audrey Flack, visual artist; and Dr. Francis Lelo, vice chancellor of Laikapia University in Kenya. Honorary degrees: Kassalow; Irving Bennett, OD; Richard Wallingford, OD. Honorary degrees: Roberts; Paralympic medalist, Marathon winner Cheri Blauwet; former US Poet Laureate Natasha Trethewey; and art leader Anne Hawley. Honorary degrees: Sister Marie Chin, mainstay of the Sisters of Mercy in Jamaica; Michael Motyl, president of Guadalupe Regional Middle School in Texas; Steve Pemberton, writer and motivational speaker; Lee Woodruff, journalist and author. Speaker: Bryan A Stevenson, founder and executive director of the Equal Justice Initiative in Montgomery, Ala.
Honorary degrees: Ella Baff, longtime director of Jacob’s Pillow international dance festival; Kevin Condron ’67, former Holy Cross board chair and community leader; and Worcester physician Richard Sacra, who contracted Ebola while caring for those stricken in Liberia. Honorary degrees: To be announced on Commencement Day. Honorary degrees: McCarthy; Jack M Connors Jr, chairman and founding partner of Hill, Holliday, Connors, Cosmopulos, Inc.; Hubie Jones, social justice advocate; Bernard Osher, started Bernard Osher Foundation to improve life through education and arts; Deval L Patrick; Zhang Haidi, chairperson of the China Disabled Persons’ Federation and president of Rehabilitation International. Honorary degrees: Deval Patrick; Frank Deford, weekly commentator on NPR’s Morning Edition, senior correspondent on the HBO show “RealSports”; Gish Jen, author of four novels; Mario J Molina, developed the CFC-ozone depletion theory.